This week’s broadcast coincided with the Emergency Day of Action – Solidarity for Elsipogtog on December 2, 2013. The call was made by HWY 11 Land Defenders. Hwy 11 is the site of one of the encampments in Mi’kmaq Territory where Mi’kmaq peoples are protecting the water from Houston Based company SWN who are trying to conduct seismic testing for fracking on unceded Mi’kmaq lands. The RCMP are attempting to repress resistance to fracking there, through harassment, violence, and arrest. It is with great appreciation and honour that we present for you the remastered recording of a Yom Kippur radio show hosted by David Migel Lerman, זיכרה לברכה (may his memory be for a blessing). Throughout the 1990s David hosted “Chagigah Shel Am” as part of the Jewish Cultural Hour on jazz radio 88.9fm in Milwaukee, WI. Many Jews in the Milwaukee area donated their Jewish music recordings to David so he could play them on-air. Famous Jewish musicians from around the world joined the show as did David’s kids, who helped announce songs and sing on-air. We present for you Chagiga Shel Am’s Yom Kippur specially originally broadcast in the early 90s on 88.9fm during the Aseres Yemei Teshuva (Ten Days of Repentance). A huge thank you to Nom for sending us this recording of their father’s show to play for you. This is a groys fargenign, to say the least. To a sweet and whole New Year for our listeners. May you all be inscribed in the Book of Life. We are very pleased to present our feature interview with Narrow Bridge Candles founder, Jonah Aline Daniel. Jonah makes and sells beautiful beeswax candles for Hannukah, Shabbes and Havdalah in the Bay area in California, using locally sourced, 100% pure beeswax with no dye or perfumes. 10% of the proceeds of Narrow Bridge Candles go towards the Stop the JNF Campaign. We had a great conversation with Jonah about DIY Judaism, the value of ritual, Jewish anti-zionism and more. Click here to order your Hannukah candles today! The early order deadline of November 2nd is fast approaching. With music by Le Trio Joubran (“Tanasim”), Yoni & Malcah (“BDS”) and Ofra Haza (“Kol Ha’olam Kulo”). Hi listeners. we had some server switching recently and some of our earlier links weren’t working. That has been fixed (smiles). Community radio in the 613-area needs you!!! Tonight is the radio613 funding drive special! We are soliciting your call-in donations to the vibrant, nourishing community radio station here in the 613-area code – CFRC 101.9fm. Tune-in online (www.cfrc.ca) at 7pm: We have a feature interview with the director of the recently released DVD, The Klezmatics: On Holy Ground – Erik Greenberg Anjou. Making a pledge to CFRC during the show tonight not only makes you eligible for some amazing prizes from the station, but you also be entered into a draw for a copy of The Klezmatics: On Holy Ground (with DVD bonus feature klezmer!!!!). Of course, you can also get a tax receipt (no taxes for the Queen!!!) or just feel great about supporting community-run media and our radio collective. Our pledge line is 613-533-CFRC (2372). If you don’t have the chance to call-in tonight, you can pledge online here. Pincus and the Pig on your radio! “Did you hear of Boychick Pincus, how he opened wide the gate and hippity-hopped over the sweet warm meadow?”So begins Maurice Sendak’s inimitable recasting of Prokofiev’s “Peter and the Wolf” in which Peter has become Pincus and the wolf is Chozzer Pig. Like Prokofiev’s ever-popular piece, this version is a narrated story with musical accompaniment in which each character is represented by a theme in the music. Sendak and Shirim have collaborated to create a delightful multi-layered Jewish version of the story and music which, in live performance, features large-screen projections of Sendak’s fantastical artwork. Shirim’s remarkable klezmer reworking of the score captures the excitement and humor of Sendak’s script, from the scuffles between the kvetchy bird and the cranky duck, through the daring capture of the beastly Chozzer Pig, to the triumphant march as Pincus, his grandfather (Zeyde) and the Cossacks carry the pig off. You’ve only got 3 days left to order your handmade, BDS-supporting beeswax Hannukah candles from Narrow Bridge Candles! These candles are more beautiful and smell nicer than almost any other Hannukah candles we’ve used. More importantly, the candles are made outside of Israel and 10% of the proceeds go to the Stop the JNF Campaign. Decolonize your Hannukah ritual this year! Support BDS! Also…stay tuned to radio613 in the coming weeks for an interview with Narrow Bridge Candles creator jonah aline daniel. Click here to watch a video about Narrow Bridge Candles. Click here to order your candles now. Shabbat and Havdalah candles available as well. radio613 presents an hour with musicians Basya Schechter and Avi Fox-Rosen. This week marks the official release of Basya Schechter’s album “Songs of Wonder” (Tzadik Records). 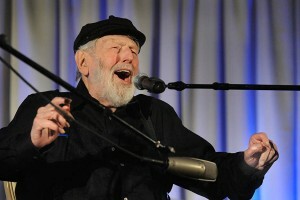 The project sets the Yiddish poetry of activist and Jewish theologian Rabbi Abraham Joshua Heschel to music. A CD release party for Songs of Wonder is happening on Wednesday, November 30 at Le Poisson Rouge in New York City. radio613 caught up with Basya and Avi at the Workmen’s Circle/Arbeter Ring’s “Vokh in Yiddishland,” a week of celebrating, learning and teaching Yiddish, where the duo performed selections from Pharaoh’s Daughter as well as their inventive and moving musical interpretations of Yiddish poetry by Heschel and Itzik Manger. Episode 57 features brand new tracks from the (highly recommended!) Songs of Wonder album, an interview with Basya and Avi, plus sounds from their Arbeter Ring concert. To follow along with a translation of Heschel’s yiddish poetry, click here. Buy “Songs of Wonder” online here. This year, the radio613 collective survived the rain and cold in our beautiful little sukkah WITH a recorder! Tune in to hear our rituals, thoughts, readings and discussions. With beautiful music from Steven Bernstein, the Afro-Semitic Experience, the Klezmatics, and the Shondes. If you are sad the simcha is over and want to spend a little more time relishing in the wonders of sukkos, you can also give a listen to our previous sukkot shows from 2009 and 2008. Between the 1880s and the beginning on the 1st world war, poor and working class Jews in north america were highly involved with class struggles as anarchists and socialists. In this episode of radio613, we share with you the sounds from the short documentary Free Voice of Labour: The Jewish Anarchists. Free Voice of Labour is a translation of the name of a Yiddish-language anarchist newspaper, the Freie Arbiter Stimme, (roughly transliterated), which published well into the 1970s. The film was made in 1980 and features interviews with over a dozen Jewish anarchists. Listen to our broadcast here. If you are in Kingston on Sunday at 7pm, please come check out this presentation co-hosted by radio613 and SPHR, featuring Israeli anarchist Noam Lekach. The talk is part of the cross-Turtle Island fundraising tour to cover legal costs of Israeli State repression of the popular struggle against the Occupation in general and the Apartheid wall in particular. Oh, don’t think the world is a tavern. Oh, don’t think the world is a market. The heavens – a curtain, so God shall not see! The earth is to soak up the blood of the victims. Oh don’t think the world is a wasteland. Episode 17: Who knows three – yiddish stories? Accompanying music by Black Ox Orkestar, Flying Bulgar Klezmer Band, Andy Statman and Zev Feldman, and Boban Markovic Orkestar. Readings by Malcah. While Sholom Aleichem recounts the news of the Dreyfus Affair travelling to Eastern Europe, the show concludes with a presentation by Dr. Ariel Salzmann: “What will we learn from l’affair Arar?” Dr. Salzmann discusses the parallels between the anti-semitic fervor that led to Alfred Dreyfus’ unjust trial and the anti-Muslim attitudes and policies that led to Maher Arar’s rendition. Tune-in.